The Blog demonstrate a method to Copy Multiple Text Documents to a Single Text Document, using StreamReader & StreamWriter Classes. #2: StreamWriter class provides an access to write the data from Stream such as Text File. Here I implemented the Code for converting multiple Text Documents into single Text Document. 2. Select the Input Text Files (code for “Select Input Files” Button). 3. 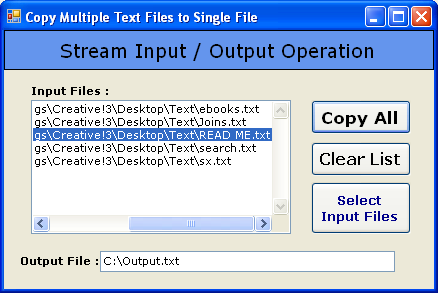 Copy Data from Multiple Text Files to Single Text File (code for “Copy All” Button). 4. Now execute the Application and see the result (Figure 1). In this piece of writing, using C# environment, we have seen basic stream input/output operation for copying multiple text files to single text file using StreamWriter & StreamReader classes.